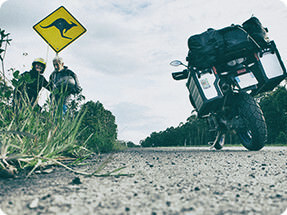 Yamaha Journey Vol.17 - Resonating Worlds | Yamaha Motor Co., Ltd.
Land Down Under and Journey's End. 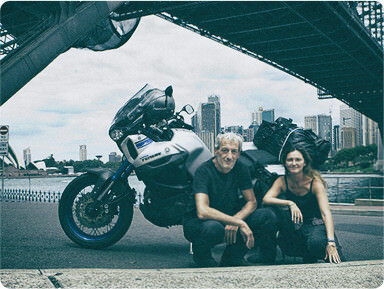 Frederique and Aldo embark on an epic 30,000km motorcycle adventure across the globe to ride from Paris, France to Sydney, Australia. 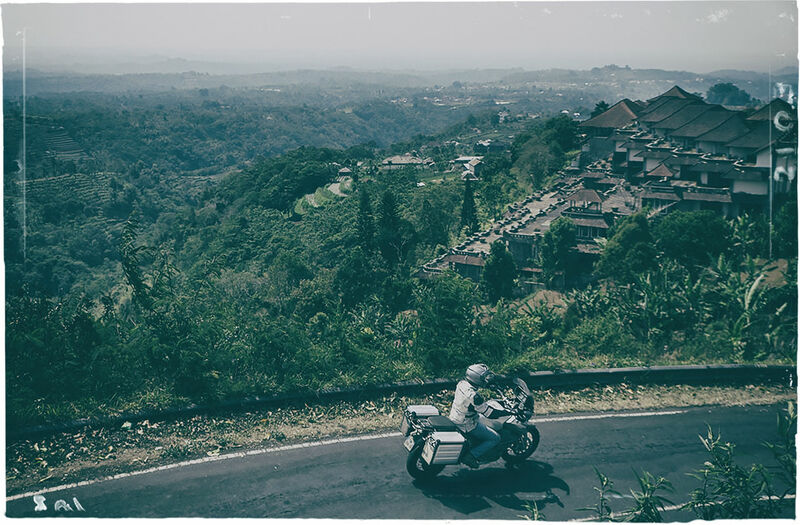 In this third part of their vast journey, they stumble across a surprise motorcycle heaven in Malaysia, pass through breathtaking mysterious Indonesian landscapes, before a triumphant arrival at their final destination. 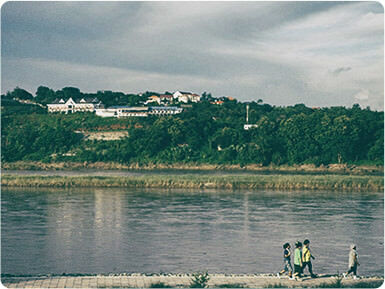 On the banks of the Mekong river that doubles as the Thailand-Laos border. 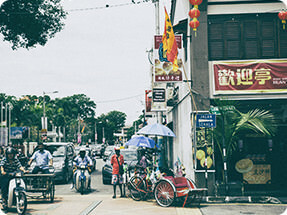 The multicultural town of Georgetown where a mix of Indian, Chinese and Malaysian history has influenced everything from the local architecture to the food. Traditional architecture built on the side of a mountain. 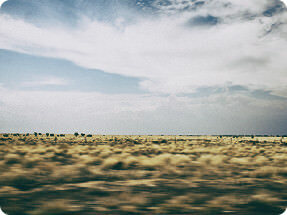 The vast stretching road that cuts through the sparsely populated outback landscape. 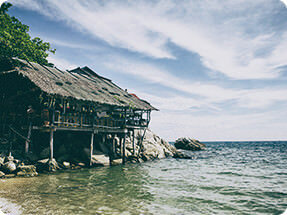 We plunge northwards leaving the balmy waters of Ko Tao island to ride towards the dense and mountainous jungles of the Golden Triangle, once the center of the opium trade, and where Thailand meets Laos and Myanmar, one of the most secretive countries in the world. 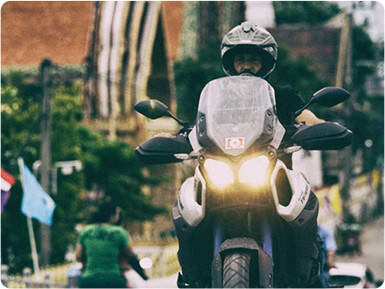 It's August 2015 as I ride the Yamaha while Aldo follows on behind in a car with three children, Arthur, 16, Cassandre, 14, and Ilona, 14. 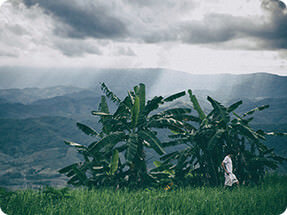 A winding, pot-holed road sweeps through banana tree cultivations before we pause at the Mekong, a giant, syrupy ooze that flows all the way from the Tibetan plateau through the Mekong Basin, one of the richest areas of biodiversity in the world. 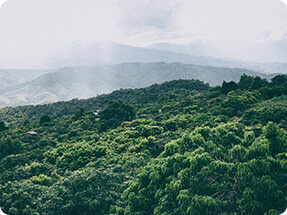 New species are constantly discovered in this Jurassic Park-esque jungle, and the river is home to prehistoric creatures like the giant freshwater stingray which can grow as long as 5 meters. We ride through peaceful villages where we are welcomed as travelers because not many tourists venture this far north like us. 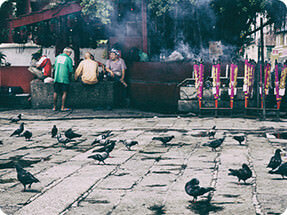 We spend a night in Chiang Rai, a jewel of a city founded eight centuries ago. Refreshed, we set out south for the two-week ride to Malaysia, stopping in Bangkok for a couple of days to drop the children off at the airport. 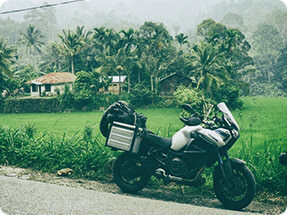 After they are on their flight, Fred climbs onto the back of the Yamaha and we ride south to be met at the Malaysian border by a smiling customs official in a scarf, reminding us that we are back in a Muslim country. 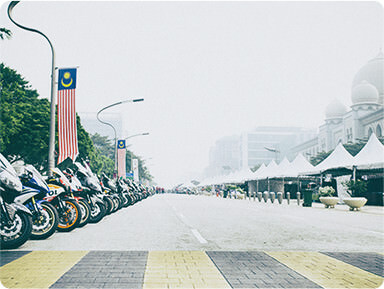 Malaysia is motorcycle heaven. 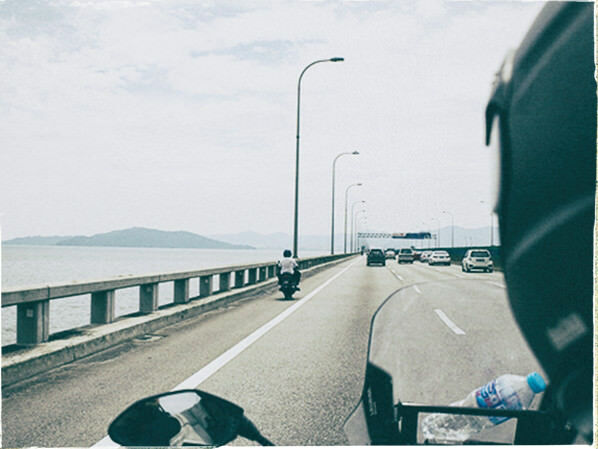 Heading west to the island of Penang we find ourselves not only riding in a designated motorcycle lane on the freeway, a glorious smooth ribbon of asphalt that is toll-free for bikers, but see that the authorities have also constructed covered parking shelters for motorcycles. 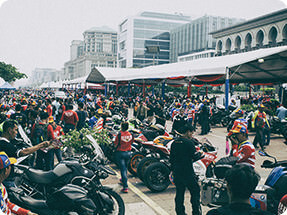 Unlike other countries, Malaysia venerates the big motorcycle: everywhere we look people are on big dual sports, exotic race machines or rare vintage bikes. 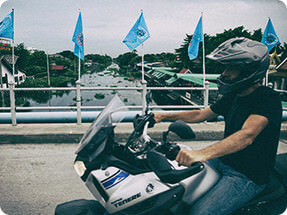 We cross a 14km bridge, the largest in Asia, to ride into Penang after a full day in the saddle. 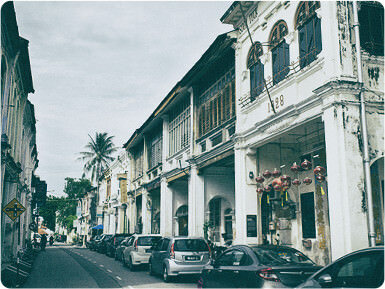 The capital George Town is like an 18th century colonial trading city that time forgot. 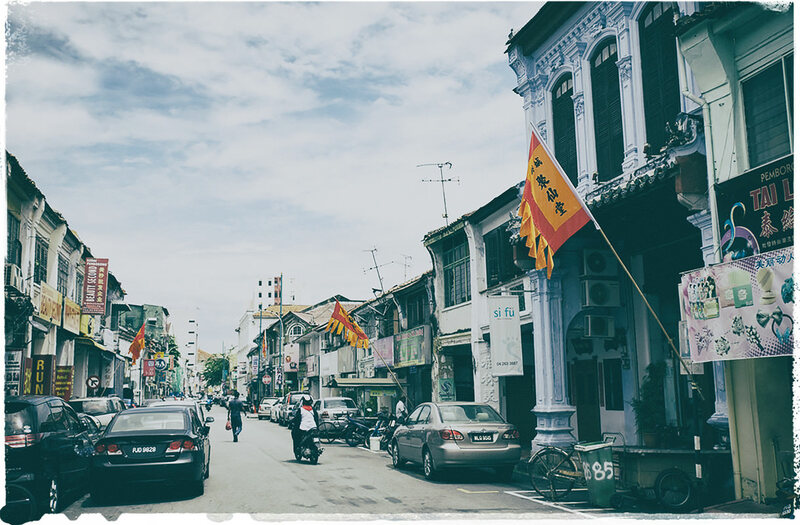 We wander the center of town, a UNESCO world heritage site, where the houses have distinctive high gable ends, louver shutters, terracotta tiles and granite edges. 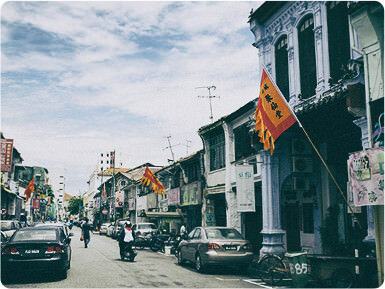 There is vibrant street art and an Indian quarter where we eat some delicious spicy curry. 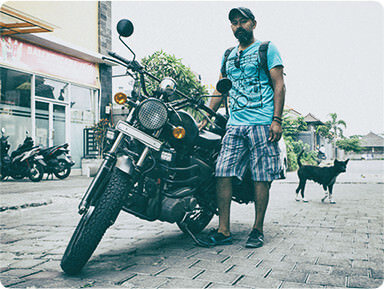 One day we meet Atul, an Indian biker with a trim beard and a thirst for adventure, on an Enfield 350 traveling to Australia. 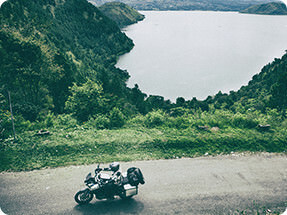 His friends couldn't understand why he would drop his well-paying job in communications and leave to travel the world on a motorcycle, but his grin and love for the open road means he doesn't have to explain to us. 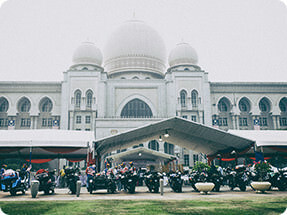 Atul told us about a huge gathering of motorcyclists in Kuala Lumpur organized by the Superbiker Association of Malayasia in conjunction with a meeting of delegates from the Association of Southeast Asian Nations. 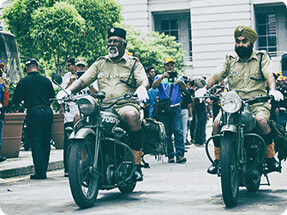 True to the rumors the city teemed with as many as 11,400 bikers: Indian Sikhs in flowing beards on vintage bikes, couples in sidecars and snappily-dressed young men preening on their race machines some of who took part in convoy rides. 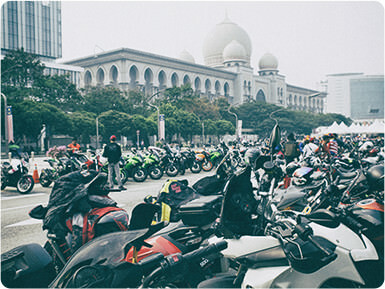 This had to be one of the biggest motorcycle meets we'd ever seen. 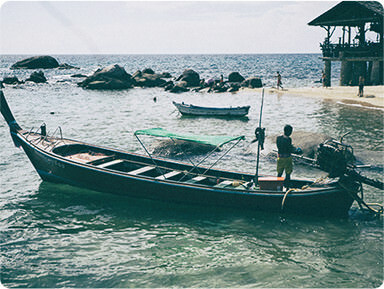 We fly to Indonesia for only 20 Euros and touch down in Medan, Sumatra, just one of the 17,000 islands covering an area of two million square kilometers that comprises the archipelago island continent of Indonesia. 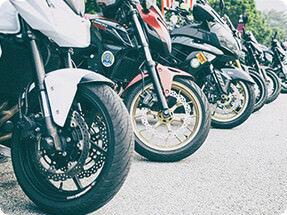 Unlike Malaysia's biker-friendly pristine highways, the roads here are pot-holed and broken, and the islands linked by poorly-maintained ferries. 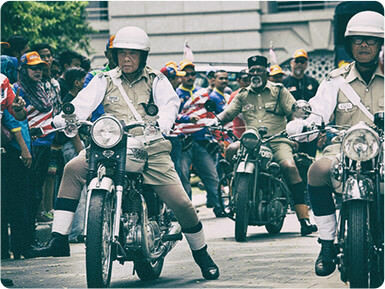 Our dismay is tempered by the grace, kindness and good humor of the Indonesians we meet. At our first stop for refreshments a man comes up and asks if we want to swap the Tenere for his broken-down scooter. We laugh. 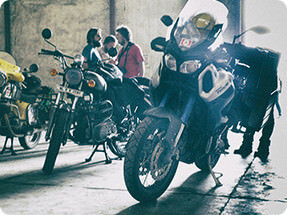 Everyone marvels at the Yamaha. They are not used to seeing big bikes here. At another place a woman standing on her balcony invites us into her house. 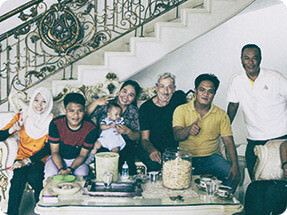 The woman is fascinated with Fred's story as a female living such an adventurous life and shunning the traditional role that would be mandatory for her in parts of Indonesia. The woman takes pictures of her whole family around the bike and asks us to spend the night. We thank her for her incredible hospitality but we have to keep going. 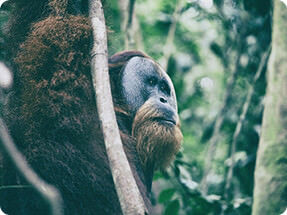 Later on we arrive at an area to discover that the jungles of Sumatra are home to the orangutan. We sign up with two young guides to see them. 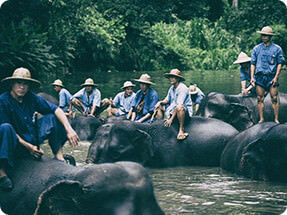 We book into a hotel on the river and cross a hanging bridge and trek deep into the forest. We had spent so long in the saddle the past few months we are unused to walking, and the heat and humidity on muddy trails and the scrambling over rocks completely exhausts us. We give up hope of seeing one. But then we finally catch sight of a curiously human-like face staring at us from out of the foliage. The guide tells us to be still, as we marvel at the creature before it melts back into the jungle after a few minutes. 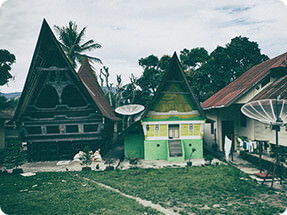 A day or so later we cross Toba lake by small boat and spend the night on the small volcanic island of Samosir. 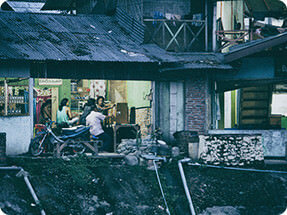 The local people live in houses built on stilts with distinctive crescent-shaped roofs. 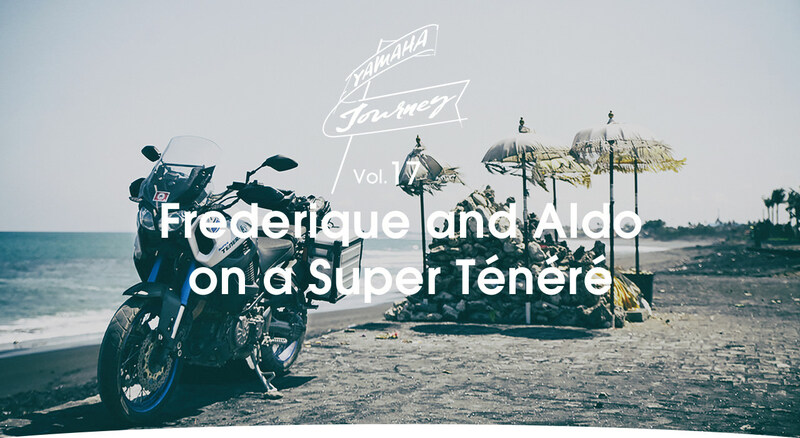 We emerge from the jungle and climb aboard the Tenere to head south. Charged particles from vast forest fires on the east coast of the island have turned the sky an incandescent white as we make our way down narrow roads thronging with heavy traffic. 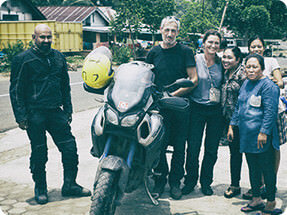 It takes three to four days to reach a port where we load the Yamaha onto a ferry and cross onto Java. The island, home to the capital Jakarta, is densely populated and the roads throng with traffic, very different to the sparsely populated jungles of Sumatra. 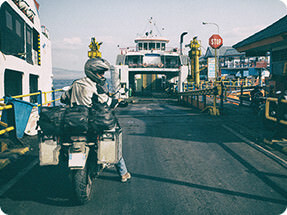 We cross the island in a week and catch another ferry to Bali. We arrive on Fred's birthday, October 2nd. 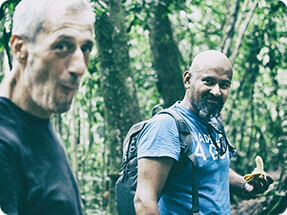 And shortly after that Atul, who had been a loyal travel companion, leaves us for Australia. 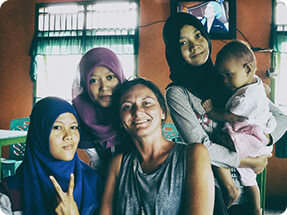 We rent a house and after a few days some friends and four of our children fly in from France to meet us. Even better, we cross to the neighboring island of Lombok which was breathtaking for its silver sand and hot tropical seas. 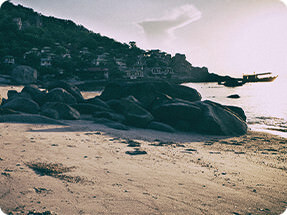 Every day we live a heavenly island existence, surfing all day and then buying freshly caught fish at a local market and making dinner with rice and washing it down with local beer. 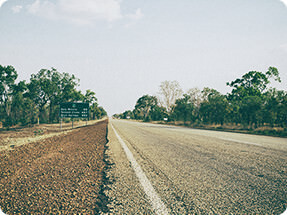 After a month and a half everyone leaves and, finally, we turn out attention to the final leg of our journey: the blazing desert heat of the Australian outback about a 1000 miles to the south east across the Timor sea. 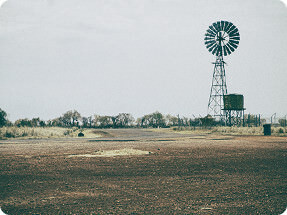 We flew ourselves and the bike to Darwin and began the 4000km to Sydney; a trip across the broiling, rust-colored vastness of the Outback. 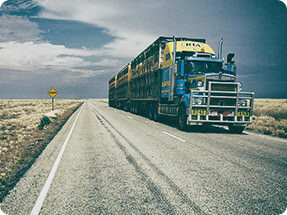 The Yamaha grinds up the miles as we pass huge road trains, trucks hauling three or four trailers. 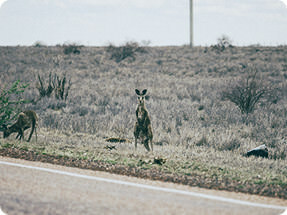 We feel we are in an Antipodean version of the American wild west when we meet men in cowboy hats and dark glasses driving earth-smeared 4x4's. 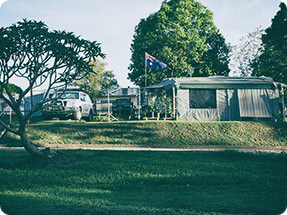 We camp out under the stars or stop at small roadhouses where we are treated warmly. We detour via Brisbane and hit the gold coast where Outback cowboys are replaced by urban hipsters in big beards wearing board shorts. 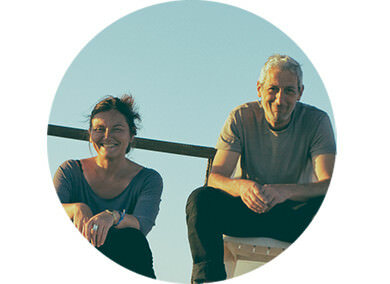 After the dry heat of the outback the salty air rolling in from the Coral Sea is like the best air conditioning. 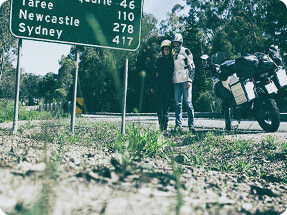 We don't stop for long and begin the final 1000km to Sydney. The Yamaha had become an old friend. 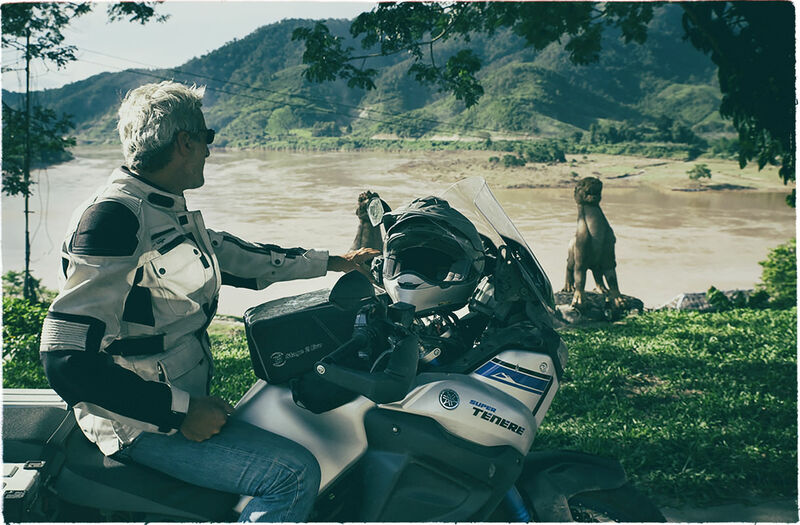 It had taken us 30,000km from the rugged shoreline of the Adriatic, through the deserts of Central Asia and up the icy mountains of the Himalaya, and into the jungles of Sumatra and the deserts of Australia. Nonetheless it still ran smoothly as it had when we had left Paris six months earlier. 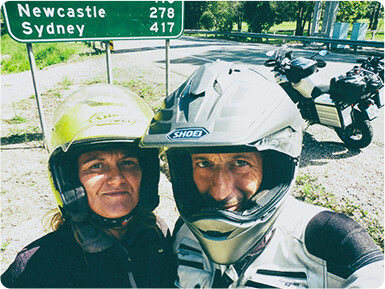 It was November 2015 as Fred gripped my waist and we entered Sydney, our final destination. There was a little less of me to hold. I realized I had lost between 5 to 10kg from the rigors of the road. 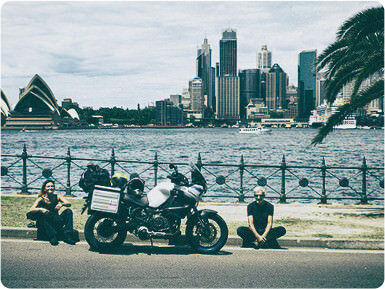 We stopped across from the Sydney Opera house and triumphantly took pictures. And so, finally, we reached a hotel and packed ready to go home, back to France, our children and our lives. 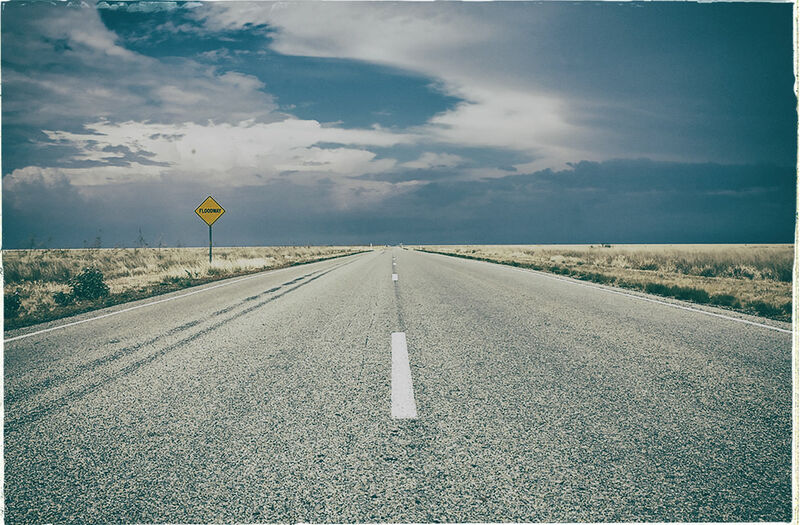 Throughout the whole trip we said we wanted to reach the end of the world but we realized in doing so that it really wasn't that far away. And in that moment I broke down in tears. I realized I never wanted to stop living like this.